Click the arrow in front of "Line" in step 3 to view how this is created! 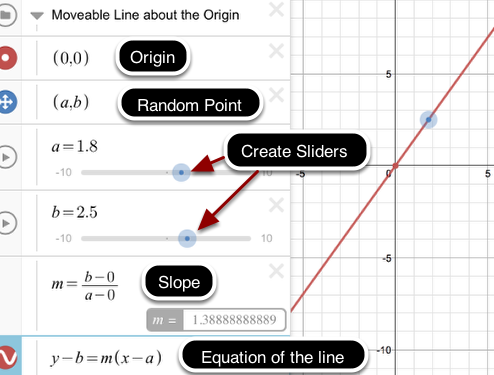 Create a line with a stationary point at (0,0) and a moveable point which allows the user to pivot the line about the origin thereby changing the Slope. Add a new folder from the "+" menu and name it such as "Moveable Line about the Origin"
Delete the current lines so that you do not repeat variable names. Type the following steps without the comments in the ovals. The sliders are automatically created when clicking "add sliders" ALL! Click on the "Moveable line" to resave! Click on "Save a New Copy".